Giuseppe Verdi’s Otello and Falstaff are operas that might never have been. That they and Verdi’s revised version of Simon Boccanegra exist is thanks in large part to Arrigo Boito, a poet and composer nearly thirty years Verdi’s junior. 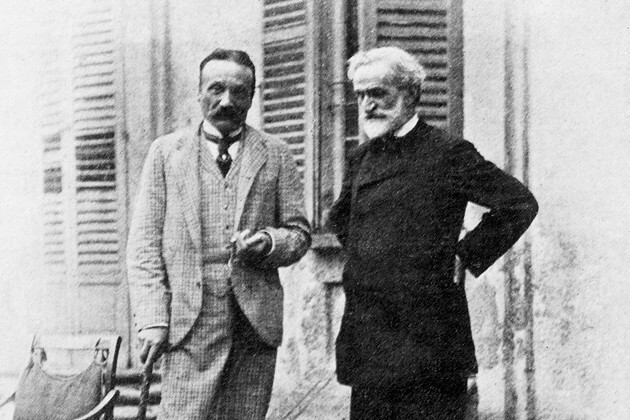 Unusual among Verdi’s librettists, Boito was a major creative figure in his own right, who coaxed and cajoled the master out of retirement. Yet despite the magnificent fruits of their partnership, for most of the time the two knew each other many would have thought Boito was the last person in the world to be able to convince Verdi to do anything. Their long relationship was tempestuous and fraught – as their letters reveal. Verdi and Boito first worked together as early as 1862, more than 25 years before the premiere of Otello. Completely against type, Verdi had agreed to provide an occasional cantata for the International Exhibition in London, with words provided by Boito, then aged 20 and fresh from his studies at the Milan Conservatory. This brief collaboration seems to have gone well, with Verdi making a gift to Boito of a watch with an accompanying, somewhat paternal note: ‘May it remind you of my name, and of the value of time.’ But in the next few years Boito’s youthful ebullience would set them at loggerheads. The year 1863 was momentous for the scapigliatura, but a disaster for Boito-Verdi relations. At a party celebrating the success of his close friend Franco Faccio’s opera I profughi fiamminghi, Boito recited an off-the-cuff ode. Carried away in celebrating his friend’s triumph, Boito grandly uttered what was to become an infamous couplet: he described how the altar of Italian art was ‘befouled like a brothel wall’. Verdi, by then regarded internationally as the leading representative of Italian art, took it as a slap in the face. Verdi’s letters show him chewing on that couplet for years afterwards, making wounded allusions to the befouled altar more than a decade later. And yet the Italian opera world was small, and Verdi couldn’t help but be aware of Boito’s achievements, and become intrigued by his work. Their shared acquaintances, the publisher Giulio Ricordi and Verdi’s wife Giuseppina chief among them, cautiously but persistently pressed the idea of a collaboration that would unite Boito’s poetic genius with Verdi’s developing musical language. Verdi resisted, strongly and for a long time. But a turning point came in 1879, when Ricordi shared one of Boito’s letters with Verdi. Boito, encouraged by Ricordi, had completed a draft libretto for Otello. He wrote to Ricordi, ‘even if V. no longer wants me as a collaborator, I will finish the work… he will have evidence that… I have devoted to him four months of my time with all the affection he inspires in me. For this I would not ask, God forbid, any material compensation… It would suffice for me to give V. proof that I am truly far more devoted to him than he believes’. Verdi began to be swayed. That’s by no means the end of the story. There were many bumps along the way. Otello was put to one side in place of a ‘trial’ collaboration on Simon Boccanegra. There were years of delay, Verdi always close to abandoning Otello and then Falstaff with cries of ‘Too much time has gone by! The years of my age are too many!’. All the way Boito patiently, gently, dedicatedly pursued Verdi, always accommodating requests, never accepting refusal. The sheer admiration evident in his 1879 letter to Ricordi is echoed time and again: ‘For God’s sake do not abandon Otello; do not abandon it, it is predestined for you’. Out of decades of misunderstandings there finally blossomed a great friendship, Boito becoming a regular presence at the Verdis’ home in Sant’ Agata. He was devastated by the master’s death in 1901, later writing to a friend, ‘Verdi is dead. He has taken away with him an enormous quantity of light and of vital warmth; we were all brightened by the sunshine of that Olympian old age’. Translations of Verdi and Boito’s letters are by William Weaver from by Marcello Conati and Mario Medici’s edition for University of Chicago Press. Otello runs until 15 July 2017. Tickets are still available. The production will be broadcast live to cinemas around the world on 28 June 2017. Find your nearest cinema. The production is generously supported by Rolex and given with generous philanthropic support from Mrs Aline Foriel-Destezet, Mrs Susan A. Olde OBE, Alfiya and Timur Kuanyshev, Lord and Lady Laidlaw, Mr and Mrs Baha Bassatne, John G. Turner and Jerry G. Fischer, Ian and Helen Andrews, Mercedes T. Bass, Maggie Copus, Martin and Jane Houston, Mrs Trevor Swete, Beth Madison, John McGinn and Cary Davis, the Otello Production Syndicate, The American Friends of Covent Garden, The Royal Opera House Endowment Fund and an anonymous donor.